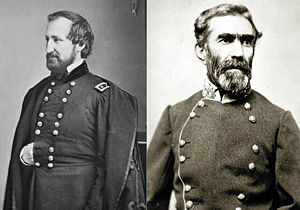 James Garfield, furthermore, served as Major General William S. Rosecrans' Chief of Staff at Chickamauga. Four months after becoming President of the United States, Garfield was shot in the back by a disgruntled office seeker and died two months later on September 19, 1881, the anniversary of the Battle of Chickamauga. 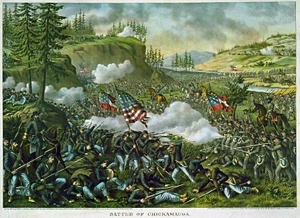 (Right) Battle of Chickamauga Map. It indicates the Union and Confederate armies, Missionary Ridge, Lookout Mountain, the lines-of-battle, and the distance between Chickamauga and Chattanooga - two critical Civil War battles. Map courtesy People's Cyclopedia of Universal Knowledge, Vol 1.